1. 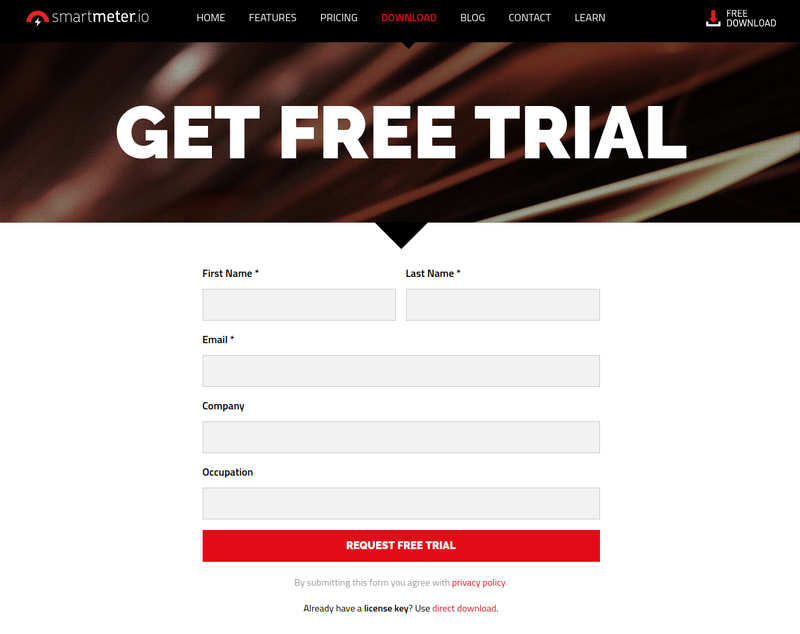 Go to Download and register for a free trial. 2. Go to your mail inbox and click Download Trial. 3. Choose your platform and click Download with license. 4. Save the installation package to your computer. 6. 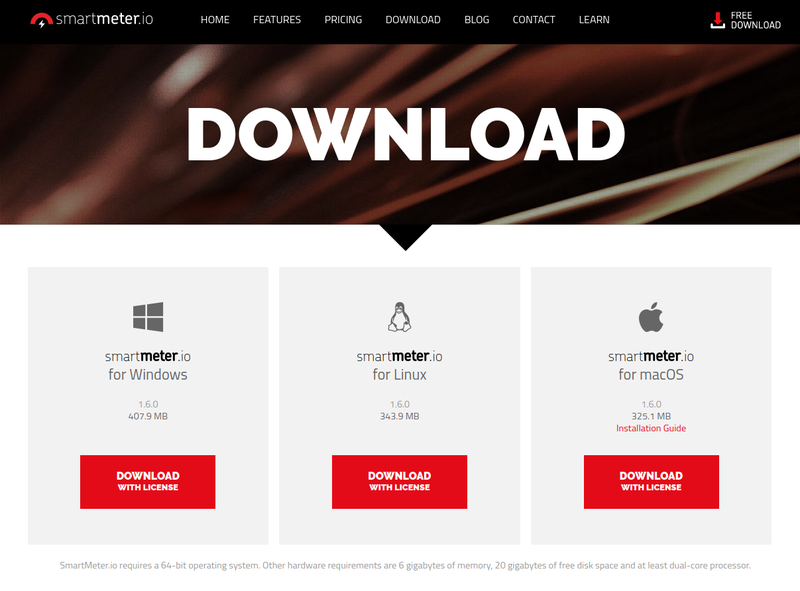 Start SmartMeter.io by navigating to the unpacked folder and run SmartMeter.exe (.sh on Linux and Mac). 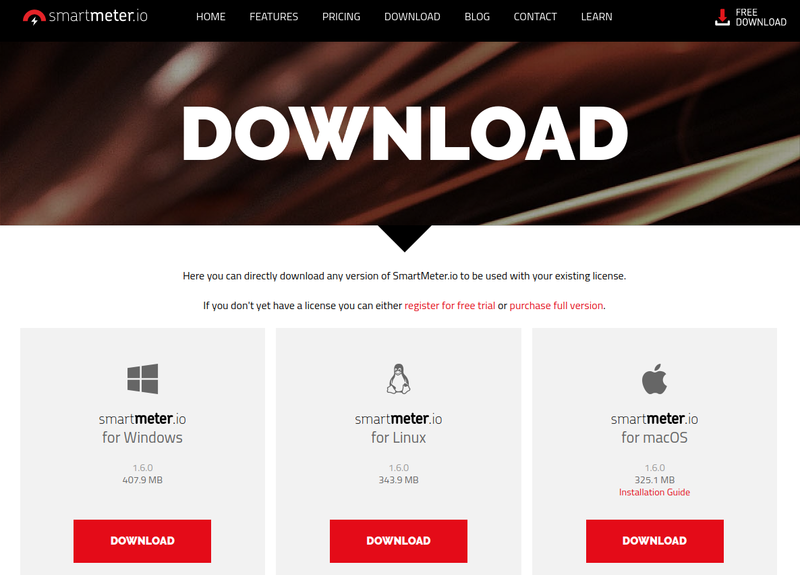 For macOS users: Open Terminal and execute sh SmartMeter.sh in SmartMeter home folder. 7. Congratulations, you are finished. 2. Save the installation package to your computer. 4. Start SmartMeter.io by navigating to the unpacked folder and run SmartMeter.exe (.sh on Linux and Mac). 5. Purchase the license and download it from your email. Then choose it from your disc and click Install button. 6. Congratulations, you are finished. 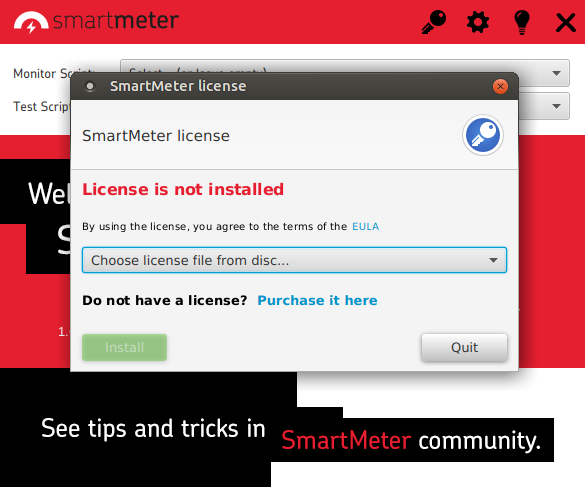 To upgrade your license click button on Welcome screen and select a new license file. Recording test scripts with SmartMeter is very easy. No proxies, no configuration. Start SmartMeter and click Start Recorder button. Give your test a name, for example “My first perf test”. 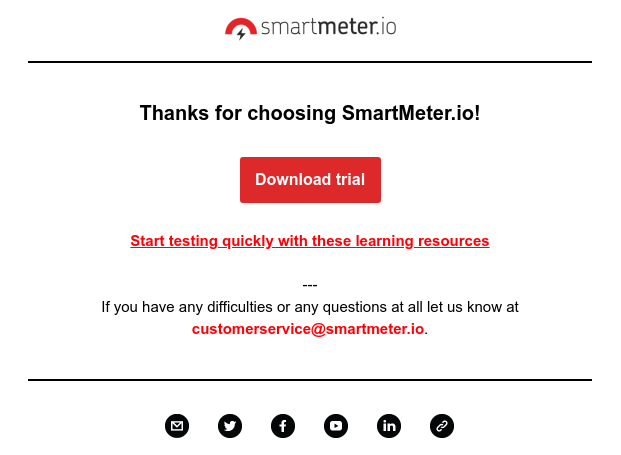 Type the URL of tested site (you can try the SmartMeter academy http://academy.smartmeter.io/university). Leave other items unchanged for now and click Start recording. The main window is split into two frames. The left frame contains a list of transactions, the right frame embeds a web browser. By simply navigating in the browser, a new test scenario is being created. The test scenario consists of transactions. A transaction is a single logical unit, for example loading home page, log in or cart checkout. A transaction contains one or more HTTP requests and maps to Transaction Controller. Once you reach the final step in your test scenario, click Save test button. The last step is to select which domains you want to include in your test scenario. The best practice is to exclude all third party domains such as www.google-analytics.com, fonts.googleapis.com, ..
Now wait until the test script is saved. Recorder will be closed and the new script will be opened automatically in SmartMeter Editor. For more detailed description of Recorder and its features refer to the SmartMeter documentation. This short tutorial is about running performance tests in GUI mode. You can also run tests in Non-GUI mode which is more suitable for test automation (scheduled jobs, Cron, Continuous integration tools). Learn more in SmartMeter Full reference. You can start tests directly from Welcome screen or from Editor. This is a preferable option if the script is not yet 100 % finished and you know you will most likely make some modifications to it. 1. Click Create/Edit Scenario button to open SmartMeter Editor. Target Concurrency - Number of virtual users (VU). Technically, the number of threads that will run in parallel. Ramp Up Time - Time to reach full load. Virtual users are added from 0 to its maximum. Green Start button - Start test in Editor. Quick, great for script development and debugging. Red Start button - Start test in new process. For serious testing, improved maximum performance. Continue to Test Runner Dashboard. 1. Select Test script. Ignore Monitor script for now. Wait for few seconds before first samples are collected. You can change graphs by dragging-and-dropping listeners from the left menu. How to understand test reports. Note: Dashboard is also available in Editor, just switch tabs. Generate report once the test is finished. SmartMeter will try to automatically open the test report in your web browser and also open the report directory. Learn more about test reports.